Magnificent and majestic historic estate designed by George Maher in 1902, is set on nearly 6 city lots of lush and private professionally landscaped gardens. Located in the Hutchinson Historic District, minutes from downtown Chicago, and steps to the park and lakefront. For this historical residential we’ve completed several projects: limestone on the interior side of the entry was coated with paint. This paint trapped moisture within the stone causing efflorescence (surface and sub-surface salts, decomposing mortar, and stone spalling). 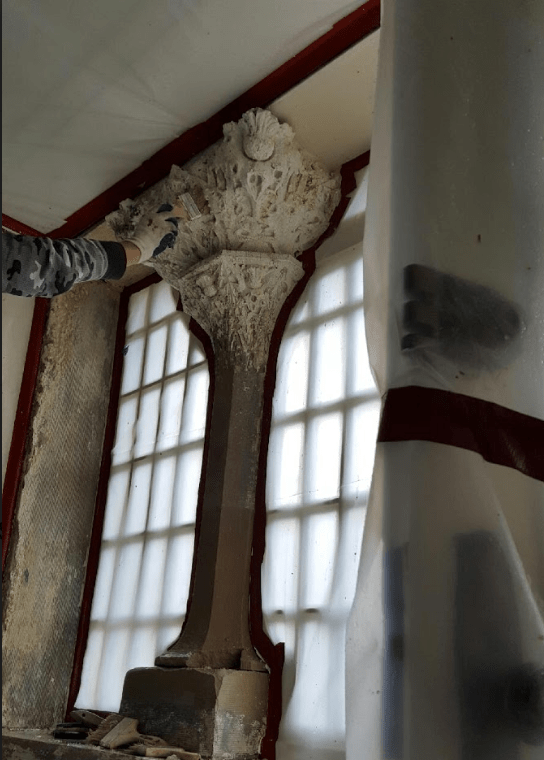 We’ve removed painting to avoid future efflorescence; once the paint was removed and efflorescence neutralized, the full extent of stone conditions was evident which helped us do a stone patching. We patched concrete steps and retaining wall spalls with custom matched concrete repair mortar on a South side entry walks.